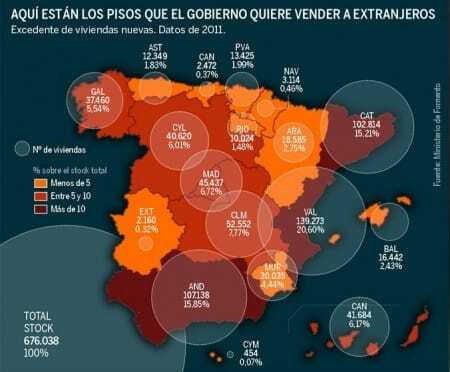 A map has been produced by Spain’s Ministry of Public Works to show where the country’s empty real estate is located. Spain hopes to market these properties, which total over 675,000, to foreign investors mainly from Russia and China but also Europe and Scandinavia. Compiled from data from 2011, the map divides the country into regions, indicating clearly where ownerless properties are located. Andalucia contains around 15% of Spain’s empty, for-sale properties – many in sought-after Costa del Sol destinations such as Marbella, Benahavis, Sotogrande, Gaucin, Casares and Estepona. This represents some 100,000 homes, many of them in beautiful gated communities offering a tranquil, safe setting that anyone looking for a second or retirement home would be crazy not to investigate. These sunny southern destinations represent the very best of what Spain has to offer; year-round sunshine, views over the Med, proximity to charming pueblos blancos and the showbiz lifestyle of the Costa del Sol. Not forgetting golf, which has already drawn thousands of aficionados to what is termed the ‘Costa del Golf’. Indeed, recent data shows 40% of Britons buying in Andalucia are looking for a property near a golf course. In terms of empty properties, Andalucia is topped only by the region of Valencia where around 20% of Spain’s un-owned homes lie. The region with the third most properties available is Catalonia, where a similar number are on offer as Andalucia. One way the Spanish government hopes to attract foreign buyers is by offering residency to those who purchase property worth over €160,000. However this has not yet been confirmed, and if it were to happen the residency would only last three years and would not allow the ‘residents’ to work or send offspring to Spanish schools.